The Lake Forest/Lake Bluff Lions Club is a local organization that meets monthly to socialize, have fun & positively affects our local and global community. Our primary mission is to improve the quality of life for the visually impaired, with a secondary mission to assist and provide an opportunity to local youth. Through fundraising efforts, we support vision research, Leader Dogs, college scholarships, little league baseball, and GLASA (Great Lakes Adaptive Sports Association) just to name a few. We are your local Lions Club. We Serve. Our 3rd Annual "Lions & Birdies Golf Classic" Charity Golf Tournament will be a smash! 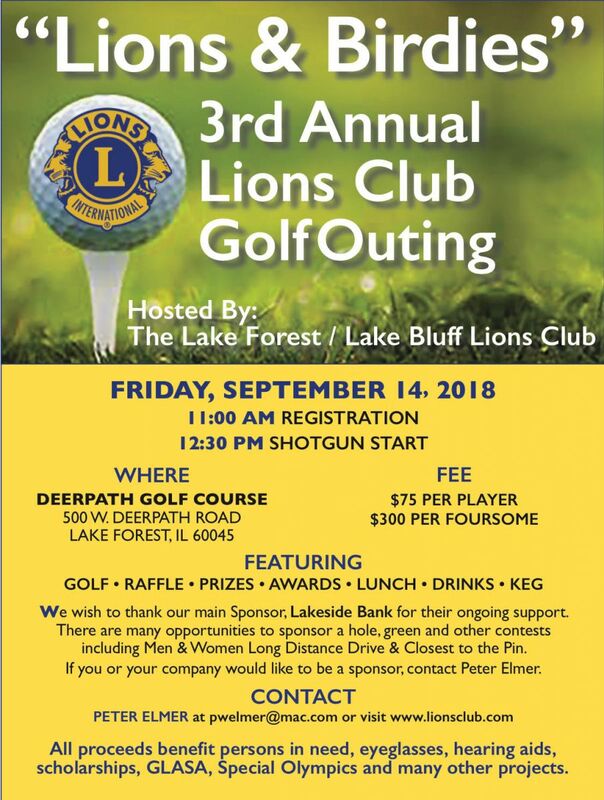 3rd Annual "Lions & Birdies Golf Classic" - hosted by the Lake Forest / Lake Bluff Lions Club is set to be an awesome event! All proceeds benefit persons in need, the visually and hearing impaired, and the community. We look forward to another great event Friday, September 14th, 2018! Congratulations to 2018 Lake Forest Lake Bluff Lions Club Scholarship winner, Anna Bazell! Lions International categorizes the eyeglasses and distributes over 2.0 million pairs of eyeglasses around the world through their eyeglass missions. Check out some of our upcoming and recent events below! The Club Hosted Ticket Sales for "Brigadoon"! 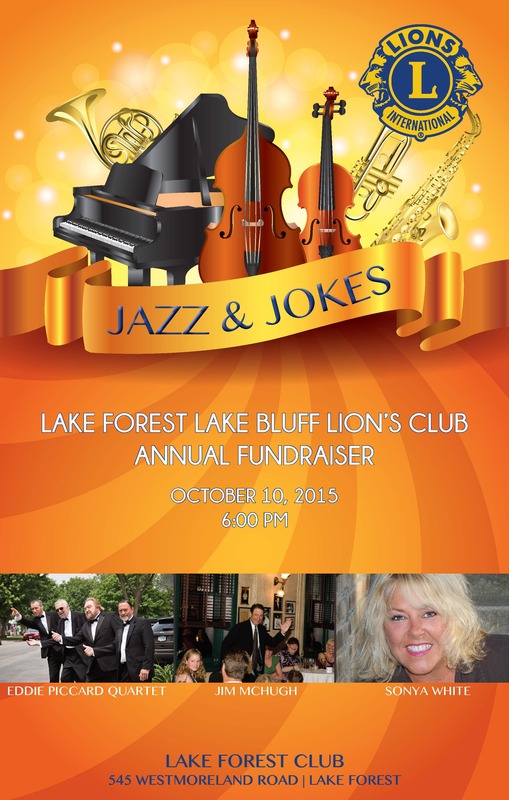 Buy your tickets HERE and support the Lake Forest / Lake Bluff Lions Club! 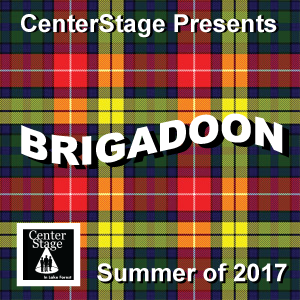 Please join CenterStage in Lake Forest for the performance of "Brigadoon"! 2/5 of all money raised goes to Lions! CenterStage in Lake Forest is a not for profit organization promoting community, family fun, and hands-on involvement for over 46 years. The club hosted its “Wine Tasting” event at Elawa Farm on Saturday, May 13, 2017, from 7:00 to 10:00 PM. 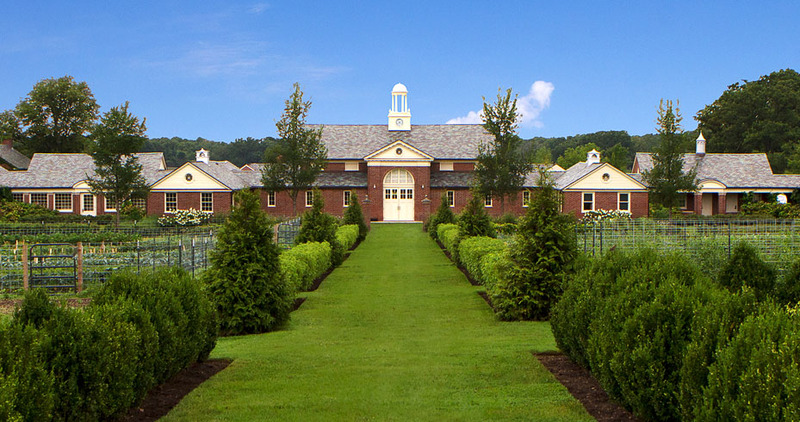 The event included the tasting and drinking of five wines: 2 red, 2 white, and 1 sparkling wine. We had delicious hors-d'oeuvres to pair with the wine. Proceeds from the event went to community need and youth programs the club supports. They include Camp Lions, Cool Pantry, CROYA, Family Service of Lake County, Foundation for Fighting Blindness, Lake County Center for Independent Living, GLASA, Midwest Veterans Closet, Safe Haven, and others. Our 1st Annual Lions Club Charity Golf Tournament was a smashing success! "Lions & Birdies - hosted by the Lake Forest / Lake Bluff Lions Club was a tremendous success! Thank you to our event sponsor, Lake Forest Bank & Trust Company, and all the sponsors, members, and attendees that joined us to make this a special event. All proceeds benefited persons in need, the visually and hearing impaired, and the community. We look forward to our second annual golf outing in September 2017! Thank you to all of those who attended, it was a special evening and it was great seeing you there! For additional information on the club and membership please contact us.